There are more than 55 safety, security and technology features, including day time running lights as standard equipment on all models, plus a five-year/100,000-mile powertrain warranty. All Dodge Grand Caravans come Standard 3.6-liter Pentastar V-6 engine, which provides best-in-class 283hp, a 6-Speed Automatic 62TE Transmission, and Touring suspension. The Grand Caravan also features 17-inch all-season tires that provide lower rolling resistance for better efficiency and all-season traction for excellent stopping and cornering performance. The all-speed traction control and Electronic Stability Control monitor your travels and if the system detects wheel slip, it applies brake pressure to the slipping wheel(s). In some cases it may reduce engine power to help maintain traction and vehicle stability. The available Trailer Tow Group is capable of towing 3,600-pounds..
Versatile and smart with a brilliant package full of surprises. The most versatile vehicle in its class with hidden nooks and crannies in the most unexpected of places so you can conquer every do-it-yourself checklist. Super Stow 'n Go seating can be easily operated with one hand. You can go from taxi for the family to do it your self-project conqueror in minutes with no need to remove heavy seats. Adjustable LED lights above the three rows will keep your occupants happily reading or gaming. Dodge Grand Caravan is the best-selling and most awarded minivan available in four models AVP, SE, SXT, and R/T. The Grand Caravan is the first to offer a dual-screen Blu-ray and DVD Entertainment System. The DVD-based system has a single 9-inch VGA screen or the class-exclusive Blu-ray-based system with dual 9-inch VGA video screens. If you want a quiet ride then no wireless infrared headphones, a remote control, an HDMI connection and two rear USB ports to keep backseat gamers charged. Nothing matters more than keeping your kids safe and secure. 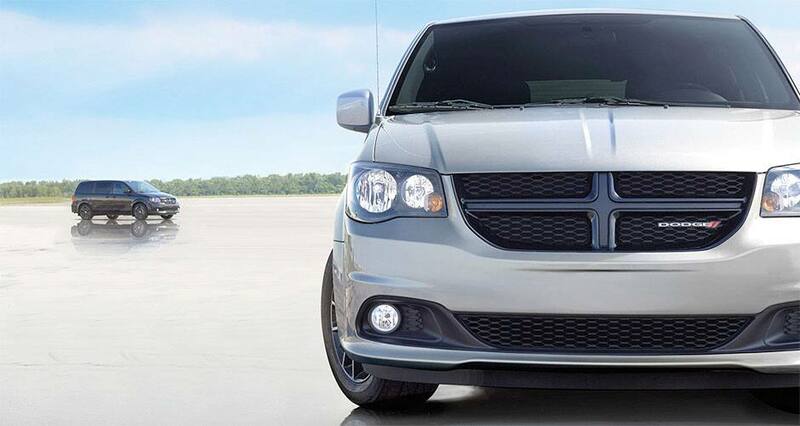 The Dodge Grand Caravan was designed with features to help protect the most precious cargo of all. The observation mirror helps you keep tabs on your backseat occupants. The Latch System has Lower Anchors and Tethers for Children or LATCH-equipped system making it easy and quick to get your child seats in right every time. Rear Cross Path Detection and Blind Spot Monitoring are there to help you see what you ordinarily may miss. Crumple zones and steel safety frame will ensure everyone's safety in the event of an impact. The active front head restraints move during a rear-end collision to decrease the space between the head and headrest reducing the risk of head and spinal injuries.